There is an amazing tiny Middle Eastern market near where I work. It has tons of spices, fresh pita bread, hard-to-find canned items and multiple barrels of fresh olives to choose from. I stepped in quickly the other day to pick up some raw tahini and came across a spice mix called za’atar, which I immediately picked up to inspect further. As I gave it a good sniff, my initial thought was that it was for making tea, until I heard a voice from behind me say, “That’s good! You can mix it with oil and put in on bread,” followed by a friendly greeting from the shop’s owner. He went on to tell me more about its different uses, and I became intrigued by the spice mix, and wondered why I hadn’t heard about it before. I bought the large bag, along with fresh raw tahini, and a handful of olives before chatting a bit more with the shopkeeper, and thanked him for his help.As soon as I left the shop, I got the idea to use it on tofu instead of bread, and it turned out to be a good one. I mixed equal parts oil to za’atar spice mix and rubbed it on some pressed tofu. I added in some roasted garlic, fresh mushrooms, onion and tomato to balance it all out, and made a little tahini sauce on the side. It was fragrant, beautiful, delicious and different. Press your block of tofu very well. 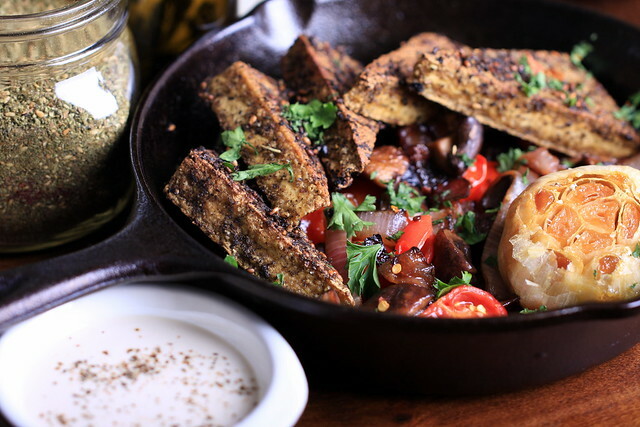 Mix the za’atar with the oil and rub it into the tofu. Place it into a glass pyrex dish and place into the refrigerator to marinate for at least two hours or overnight. Preheat your oven to 375. Slice off the top of a whole head of garlic and place into a small glass pyrex dish. Drizzle with the 2 tablespoons of olive oil, then cover the dish with aluminum foil. Roast for about 30 minutes, then flip the entire head over, spooning the olive oil over the top. Then roast for 15 minutes more, uncovered. Let it cool completely before separating the bulbs from the papery skins. Heat a little oil in a small cast iron pan over medium-low heat. Place the sliced onion into the pan and allow it to soften and slightly brown for about 20 minutes, stirring occasionally. Add in the mushrooms and let cook for about 10 minutes. Return to your cast iron skillet. Toss in the tomatoes and soften for just a few minutes. Make your tahini sauce by whisking together the tahini, water and apple cider vinegar. Set aside. Toss your tofu, garlic and vegetables together. Drizzle any leftover za’atar/oil mixture over the top. Serve with the fresh chopped parsley, cracked pepper and tahini. What a great idea! I made a berbere mix last night and used up the last of my paprika and then saw how much sumac I have in the pantry as well – making a za'atar mix would be a great way to use that. Very inventive and gorgeous, as always. Why do you use raw tahini rather than roasted? Thank you! I prefer raw tahini over roasted simply because I like the taste better, but a tasty tahini sauce can certainly be made from either! I have to echo the person before me by saying, what a great idea! I love zahtar– I just discovered it about a year ago by this fantastic middle eastern market in my town. 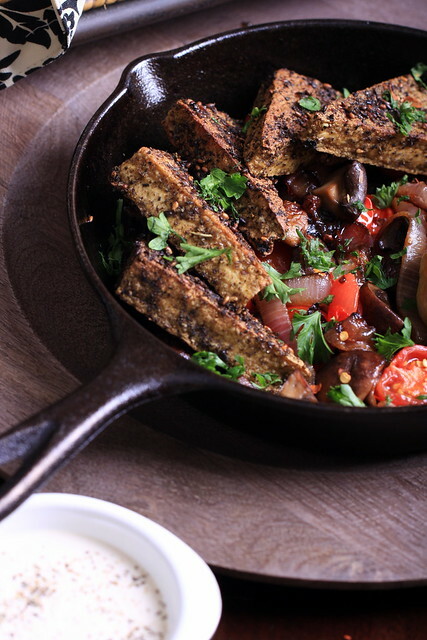 I've only eaten it with pita and olive oil, but I'm always looking for new ways to try tofu… definitely trying it soon! Thanks. Thank you for your incredibly kind feedback, adrienne! I hope you feel better soon — I am also getting over a 24-hour cold-like thing, kind of crappy for my day off! I'm just thrilled I found your site. You are a new favorite, for sure! how long do you marinade the tofu for this recipe? Anywhere from two hours to overnight. I just updated the recipe to include this. I hope you enjoy it! I just stumbled onto this blog and made this last night! I love the blog name, btw. Anyway, this was delicious. I love za’atar but have only ever used it in olive oil to serve with bread. The tofu encrusted thing is such a great idea! – definitely make sure you marinade the tofu as long as possible, and I would suggest lightly salting before rubbing with the marinade, as well. i notice the recipe does not specify how to cut the tofu, but I cut it into 8 triangles. it browned beautifully in the non-stick skillet. – we don’t like mushrooms and my husband isn’t a huge fan of cooked tomatoes, so I subbed those for broccoli and roasted red peppers with the onions. i lightly salted all this in the pan as it was cooking. this was also delicious. – the tahini we have reacted very poorly to being mixed with water. instead of making the tahini sauce as described (is that for powdered tahini, maybe??) I served the dish with tahini straight up, with lemon wedges on the side. the fresh lemon juice combined with the tahini, parsley, and broccoli was perfect! also took care of the acidity the apple cider vinegar would have provided in the sauce. 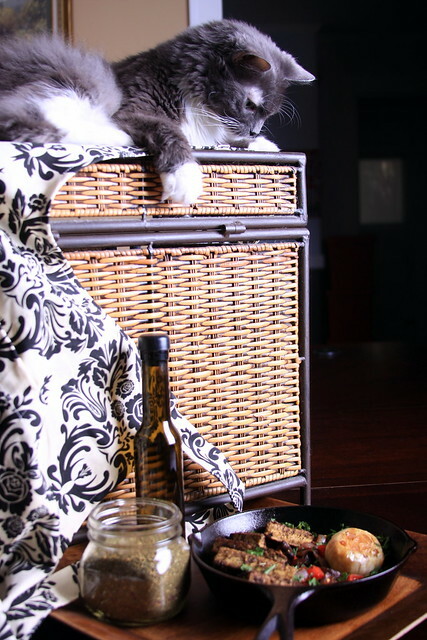 – serving suggestion: i paired this dish with pearl/ Israeli couscous cooked in veggie broth. It was the perfect compliment. I just ate the leftovers for lunch and can’t wait to make this again for dinner next week! Thanks for the recipe! This was a great taken tofu, very different than most other recipes, it was a fresh flavor and made cooking vegetarian for my family (while I’m not veg) fun again.